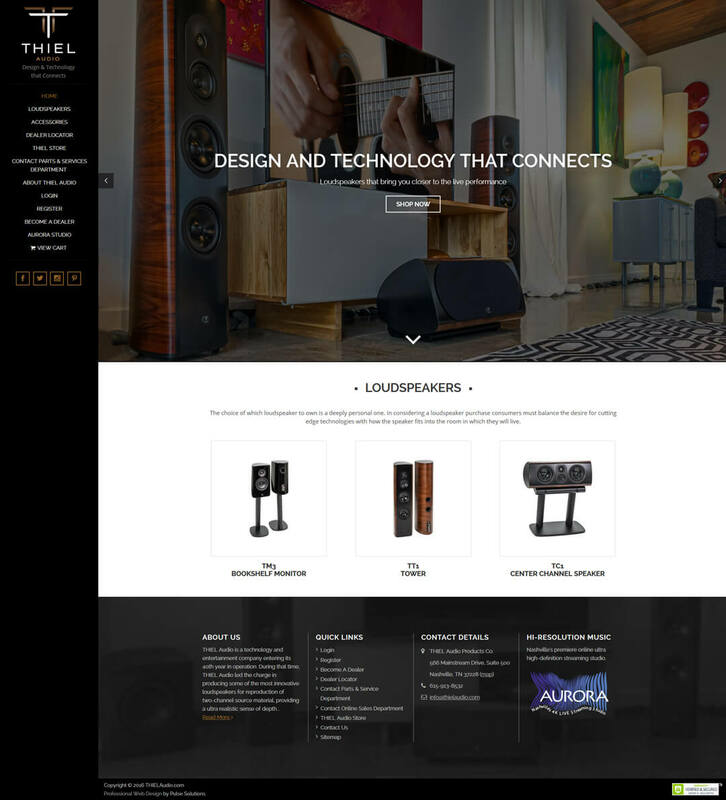 Thiel Audio produces some of the most innovative loudspeakers that enable customers to experience the very best in multi-channel audio, 4K video reproduction, wireless streaming of audio and video content. These handcrafted loudspeakers made of real wood, metal and stone accents have legendary designs and the technology and innovation used in producing high-quality sound helps bring the listener closer to the performing artist. The client had an existing website which fell short of many features. 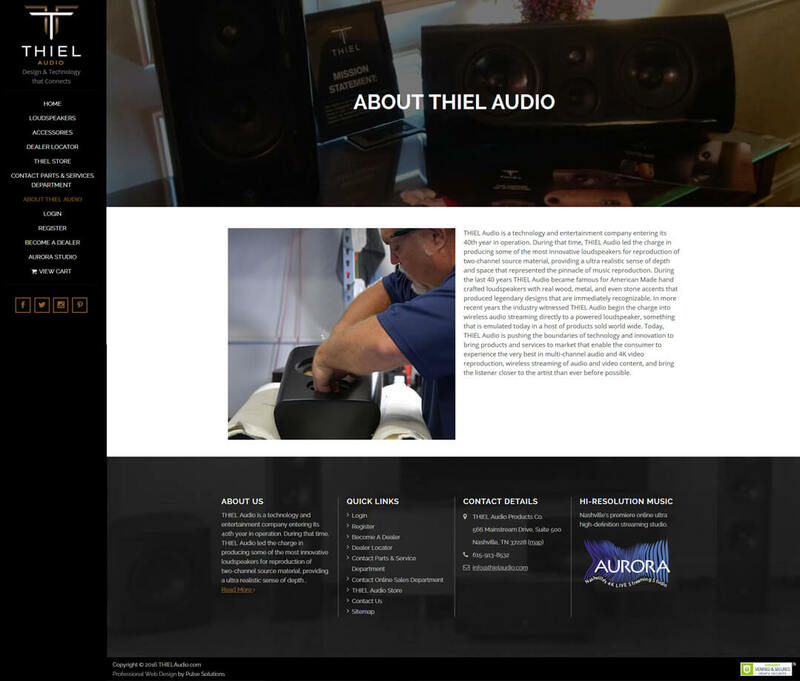 Thiel Audio requested a website to be built from scratch with a modern approach. The new website must be responsive and should have ecommerce properties so that customers could buy their products online. A complete revamp of the website to include new features. Ecommerce web development to add the convenience of online shopping for their customers. 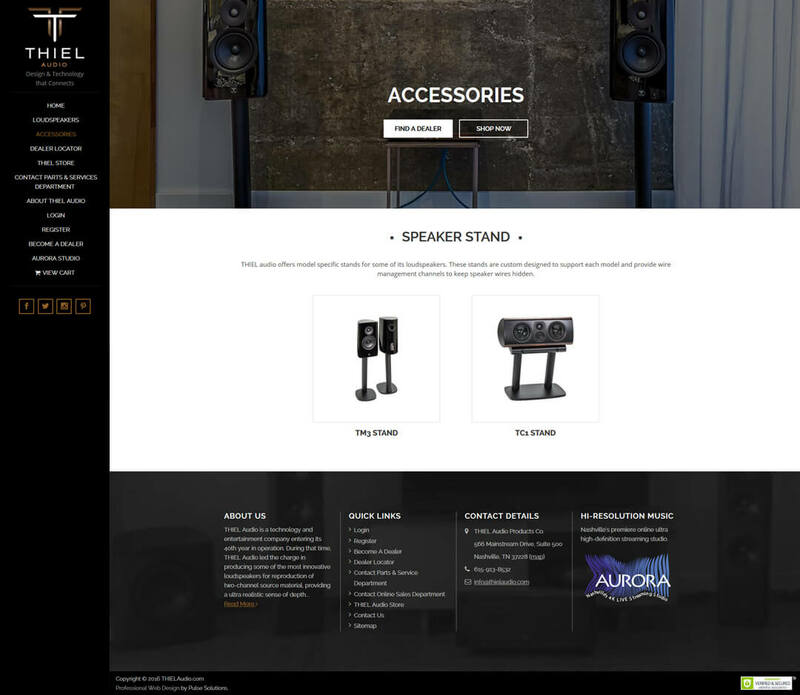 Include features to purchase speakers and stands online. 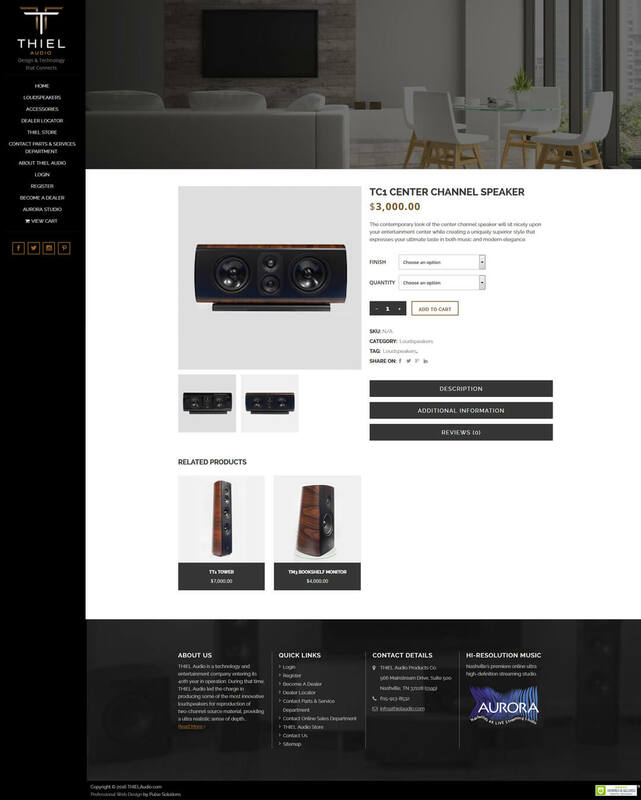 Features to add a user as a U.S. dealer or an International Distributor. Dealer locator features so that users can easily find a dealer nearest to them. Feature where a user can request to become a dealer. Users should be able to contact them for services or repairs easily. After thoroughly analyzing the requirements, the Pulse team proposed the use of WordPress, Woocommerce, with PHP as the programming language and MySQL for database purposes. The website was made responsive so that the site displayed well on mobile devices of all sizes. Created a modern website with user-friendly features. A CMS driven website was created using WordPress and Woocommerce was used to add ecommerce features. 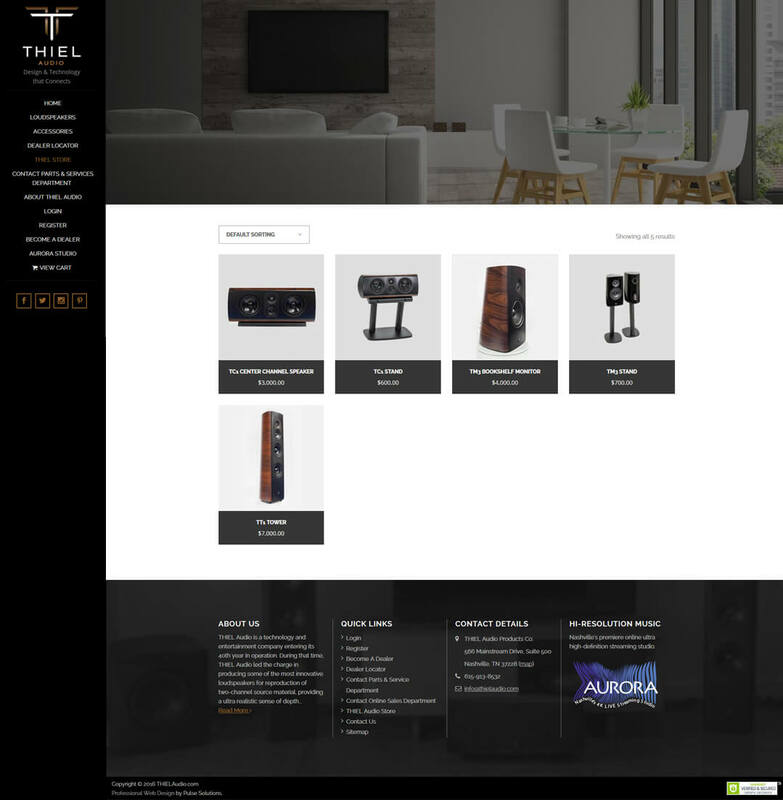 Users could conveniently purchase speakers and stands online. Other features where a user could be added as a U.S Dealer or an International Distributor were successfully integrated. Dealer locator feature was added too. Users could request to become a dealer, request for services or repairs online! Zendesk integration was used to make it easy for users to contact support. The website was made mobile responsive. A convenient way for customers to buy their products online. This also resulted in increased sales due to the introduction of ecommerce features for the website. Users can easily request services and repairs via Zendesk. Users could request to register as a dealer online. Separate payment and shipping options were included for U.S. dealers and international distributors. The project was completed within a short time span of 2 months. If you are looking for a professional web design company to create a website with the latest technology and trends, let’s talk about how we can do it together. Contact us today. How to build trust to improve eCommerce website conversions?